Since our founding nearly 30 years ago, our goal at the Celiac Disease Foundation has been clear: end the suffering caused by celiac disease. Everything we do is shaped by this objective. For example, we invest in programs that improve diagnosis. We were instrumental in the development of the first blood test for celiac disease. We continue to invest in programs and tools to educate the public, physicians, school nurses, and dietitians. We work with the food industry, medical testing labs, health insurance companies, and federal regulatory agencies to raise awareness. As a result, over the last 30 years, the diagnosis rate has improved from about 3% to a current estimate of 30-40%. Yes, that still means potentially millions of adults and children are suffering from celiac disease and don’t know it. And yes, the time between the first sign of symptoms and a correct diagnosis is still more than 6 years on average…but the evidence is clear: we are making real progress. Another area in which our investments are showing significant positive returns is the development of therapeutic alternatives to the gluten-free diet. A substantial percentage of our patient community maintains that the diet alone is not enough. Patients continue to suffer symptoms—sometimes debilitating—despite strict adherence to the diet. Their quality of life continues to be compromised, and they worry about elevated risk of developing a comorbid disease. We have invested in biomedical research to better understand celiac disease and its biochemical progression. We built the world’s largest celiac disease patient registry, iCureCeliac®, to give leading celiac disease researchers access to motivated patients and better data to advance drug development and the search for a cure. As multiple adjunct treatments for celiac disease finally began to advance down the long and expensive development pipeline toward FDA approval, researchers needed better tools to recruit celiac disease patients into clinical trials. In 2018, we launched iQualifyCeliac, an online clinical trial screening tool that matches qualified patients with the right celiac disease trials. Again, we are making real progress. Thanks to the generosity of our donors and sponsors who believe in the work we are doing, we have made tremendous progress in 2018. 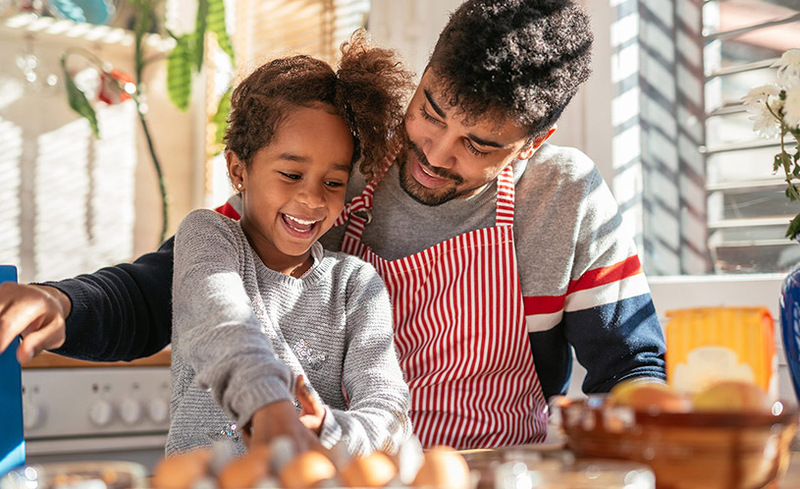 With continued support, we are confident we can continue on this trajectory until we have FDA-approved treatments and, one day, a cure for celiac disease. 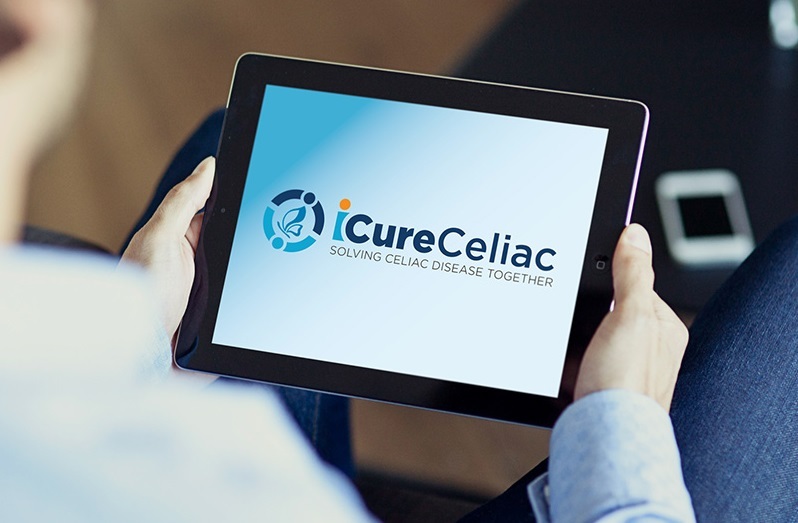 iCureCeliac® is the world’s leading and largest celiac disease patient registry. iCureCeliac® directly supports drug development by dramatically lowering the cost of research and development through access to vetted, quality data from a wide variety of patients. In 2018, the Foundation invested heavily in outreach and marketing to grow the database by 1800 patients. We are making steady progress toward our goal of 10,000 biopsy-certified patients. In addition, we are currently developing a new, more intuitive and mobile friendly software platform to host iCureCeliac®, which will greatly benefit both patients and researchers in the coming year. iQualifyCeliac is the Foundation’s new clinical trial recruitment tool. Clinical trials are mandated by the FDA to test the safety and efficacy of new drugs seeking FDA approval. The biggest obstacle in getting a celiac drug to market is recruiting enough patients to participate in clinical trials. The Celiac Disease Foundation exclusively works with trustworthy, reputable researchers to match eligible participants with the right celiac disease clinical trials and studies. In 2018, over 1700 patients joined iQualifyCeliac to advance better treatments for celiac disease. The Association of European Coeliac Societies (AOECS) The Celiac Disease Foundation has been accepted as an affiliate member of AOECS. Founded in 1988, the AOECS is an independent, non-profit umbrella of national celiac societies actively involved in international initiatives to raise awareness of celiac disease and to promote research into the diagnosis and management of the disease. The Foundation’s membership is particularly important because a number of celiac disease drugs in the pipeline are being developed by international pharmaceutical companies. Additionally, there are ongoing clinical trials that are using both U.S. and international sites. AOECS members, including the Foundation, work together to foster multinational research efforts for celiac disease. Celiac.org. In 2018, the Celiac Disease Foundation launched a newly redesigned website. Celiac.org is the most visited celiac disease website in the world. In 2018, approximately 8 million unique visitors came to celiac.org looking for the best information available about celiac disease diagnosis, symptom management, news, research, and the gluten-free diet and lifestyle. More than two years in development, the new celiac.org was completely rebuilt to better serve five key constituencies: patients, caretakers, prospective patients, researchers, healthcare providers. Highlights include improved search, a mobile friendly design, new interfaces for iCureCeliac®, iQualifyCeliac, the Healthcare Practitioner Directory, Team Gluten Free, Eat! Gluten-Free, and Meal Plans. The Symptoms Assessment Tool was also completely redesigned and relaunched in 2018. It has been clear to us since our founding that patients with celiac symptoms must be proactive with healthcare providers to get tested. Since its original launch in 2014, more than 3.6 million individuals have accessed the checklist. Since its 2018 relaunch, more than 35,000 have used the Symptoms Assessment Tool. New with the relaunch is a letter to your doctor outlining your reported symptoms and conditions, in addition to a recommendation for celiac disease testing, including detailed instructions for practitioners. Celiac Disease Foundation National Conference & Gluten-Free EXPO Hosted annually at the Pasadena Convention Center, the CDF National Conference and Gluten-Free EXPO is the leading national event for celiac disease, bringing together a diverse range of innovative researchers and pioneers in the gluten-free food industry. 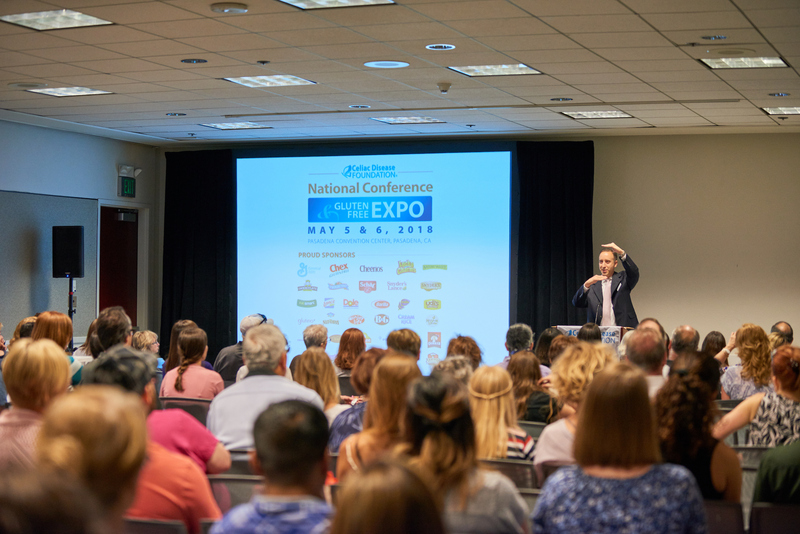 On May 5 & 6, 2018, over 2,700 patients, caregivers, healthcare professionals, researchers, biopharmaceutical and diagnostic company representatives, and gluten-free foodies attended the Celiac Disease Foundation’s National Conference & Gluten-Free EXPO. The National Conference featured keynote speaker, Dr. Sheila Crowe, and a world-renowned panel of biopharmaceutical and diagnostic industry leaders discussing cutting-edge advancements in celiac disease research. The Gluten-Free EXPO celebrated the newest and best gluten-free options with 90 companies sampling their latest products and services, cooking demos, exciting raffles, and more. Patient-Centered Outcomes Research Institute (PCORI) Marilyn G. Geller, Chief Executive Officer of the Celiac Disease Foundation, has been appointed to PCORI’s Advisory Panel on Patient Engagement. 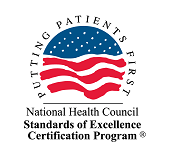 PCORI is an independent, nonprofit organization authorized by Congress to fund research to provide patients, their caregivers, and clinicians with the evidence-based information needed to make better-informed healthcare decisions. Geller joins other members of the panel in applying her experience and expertise to helping PCORI refine and prioritize the research it funds. She will also ensure that the research PCORI supports centers on the outcomes that matter most to patients and other healthcare decision makers. Federal Government Health Agencies play a central role in the research, diagnosis, and treatment of celiac disease. Historically, celiac disease has not been a priority for the federal agencies most directly involved, including NIH, FDA, and HHS. As a consequence, for example, federal funding for celiac disease research has lagged significantly relative to other diseases with similar or less “impact.” We want equity. The Foundation has stepped up its efforts to change this dynamic in Washington. We have become members of a host of key patient advocacy organizations with strong presence in Washington. Our staff and our members meet regularly with Congressional staff, FDA staff, and NIH staff. 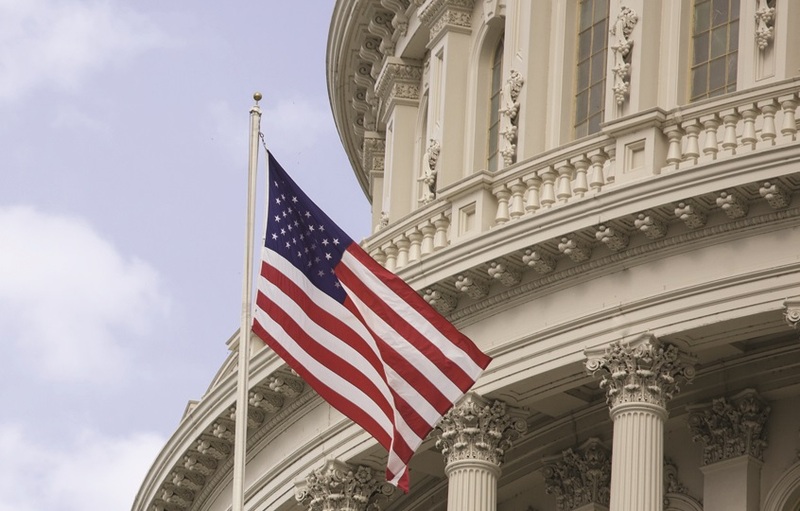 In 2018, the Foundation laid important groundwork on Capitol Hill to initiate meaningful improvements for the celiac community in the coming years. 2018 was a very successful year for our community fundraising program, Team Gluten-Free (TGF). This year, fundraising increased by 44%, demonstrating TGF’s notable commitment to supporting our programs that promote celiac disease research, education, and advocacy! This year, TGF members from across the country hosted and participated in events, including golf tournaments, basketball tournaments, raffles, cycling events, jewelry and bracelet sales, marathons, a bi-coastal Turkey Trot, and much more. The Celiac Disease Foundation is proud of our TGF members for representing and empowering the gluten-free community, and we are deeply grateful for their hard work and dedication to drive diagnosis, treatment, and a cure for celiac disease. The Student Ambassador Program empowers children, teens, and young adults to become role models for others with celiac disease while raising awareness in the community and educating their peers. Student Ambassadors strengthen our outreach and serve as our boots on the ground in schools across the country. 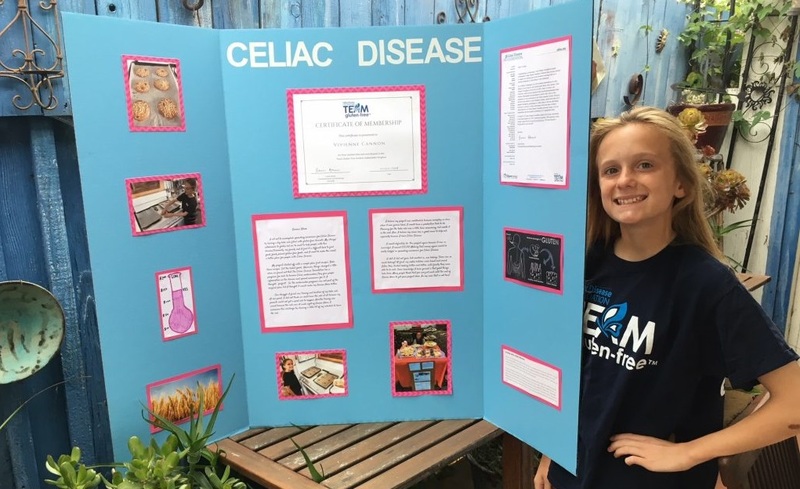 This year, more than 100 Student Ambassadors raised awareness and educated peers about celiac disease by making classroom presentations, writing books and articles, hosting educational parties, distributing brochures to peers and doctors’ offices, creating bulletin boards, and much more.